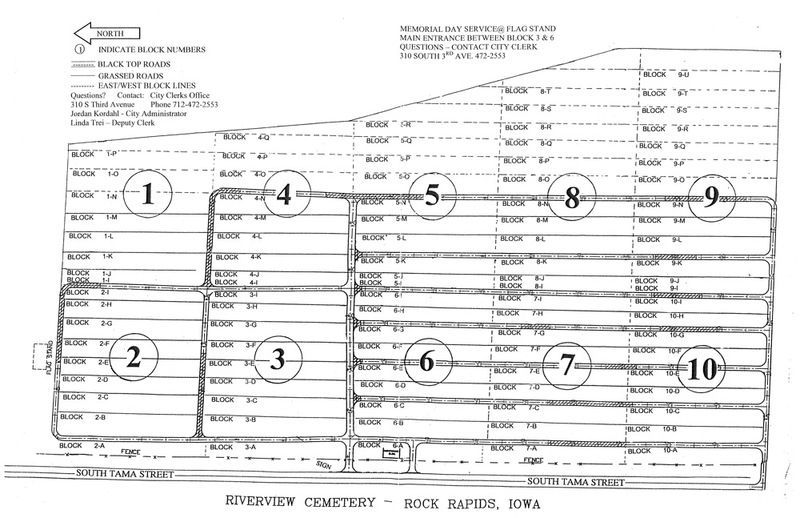 Riverview Cemetery is located on Tama Street on the South edge of Rock Rapids. Non-Resident is defined as any person living outside of Lyon County, Iowa. Non-Resident: $84.00 to Perpetual Care; $336.00 to General Fund. A.Persons within the cemetery shall at all times maintain decorum of speech and action, including avoidance of loud talking or other noise within earshot of graveside ceremonies if not part of the group participating in the ceremonies, and workers shall suspend their work when near such ceremonies. B.No person shall drive any vehicle faster than fifteen (15) miles an hour or in a careless manner upon such roads unless authorized by this Section. No person shall drive off the hard surfaced roads unless authorized by Sexton, City Administrator or other City authorized personal. C.Persons shall walk only on roads and walkways or footpaths except when absolutely necessary for maintenance of gravesites, inspection of plots, installation of markers or decoration of graves. D.No person shall deface or otherwise damage any marker, headstone, monument, cemetery fence, or any other cemetery structure. E.No person may consume liquors or alcoholic beverages of any kind on the cemetery grounds. F.No persons other than law enforcement officers and persons engaged in military funerals or like ceremonies whose functions require the carrying of firearms may carry any firearm in or upon the City cemetery grounds. G.All persons using the cemetery grounds shall deposit their rubbish and trash in the receptacles placed in the cemetery for that purpose. H.No person shall allow any privately owned dog or other animals to be in the City cemetery or any part thereof. I.No person other than the owner or the owners of the lot, City or contracted employees in the performance of their duties shall remove, carry away or destroy any vases, flower pots, urns or other objects which have been placed upon any lot. J.No skateboards, roller blades or roller skates shall be allowed on the City cemetery grounds. K.No person shall operate any motorized off-road or non-licensed vehicle upon the City cemetery grounds except as authorized by the City. SECTION 2. MARKERS, MONUMENTS, AND DECORATIONS. 1.“Monument” refers to the large family lot stone, which does not identify any specific grave. 2.“Marker” refers to a stone located at and identifying a specific grave, usually bearing the name, date of birth and date of death. 3.“Headstone” refers to a grave “marker” placed at the head of the specific burial, and also usually bearing specific name and dates. burial, and also usually bearing specific name and dates. within the Riverview Cemetery. The Council, by resolution, may adopt further regulations. 1.Monuments and markers shall have suitable foundations adequate to prevent tipping or sinking. Such foundations shall be of concrete, ground level and extend at least six inches in all directions from the monument or marker or a minimum of four inches with reinforcing. 2.Monuments or super structures 4’ or more above the foundation or longer than 5’ require approval of the Sexton prior to the structure being set. 3.The City Council reserves the right to refuse permission to erect any work in keeping with good appearance of the grounds. 4.Vases can only be mounted in ground or in line with or on the head stones to aid in maintenance. Flowers must be placed on the side of monuments. An exception is May starting on the Friday before Memorial Day and for a week after and also for two weeks after a funeral. and the property rights of lot owners within the cemetery from loss or damage. The City expressly shall not be liable for loss or damage beyond its control, and particularly, from damage caused by the elements, Acts of God, common enemy, thieves, strikers, malicious mischief makers, explosions, unavoidable civil disorder, whether the damage be direct or consequential. ABBOTT 1 42 01A ? BACH L.H. 7 2 12 ? ? BACH MRS L.H. 7 2 11 ? ? BEAMAN unma BABY 8 45 7 ? ? BISCHOFF H.H. & M. 5 29 1 ? ? BISCHOFF HERMAN 5 29 2 1895 ? BOWEN 7 35 6 ? ? BOWEN 7 35 5 ? ? BRADLEY RUFUS 6 39 5 ? ? CLAUSSEN ALVIRNA 8 10 5 1892 ? COLEMAN UNKNOWN 4 13A 7 ? ? CRYSTAL HOEPPNER 4 6 05A ? ? FOLEY GREGORY 9 41 7 1900 ? GARLTIDE 6 13 2 ? ? HEIMENDINGE NO NAME 8 32 7 ? ? HUSEMAN EDNA 2 26 2 1888 ? JESSUP INFANT 7 31 7 ? ? MANNING LAWRENCE 6 38 12 ? ? MEINTS UNKNOWN 4 13A 8 ? ? ROSS DAVID 7 5 2 1937 ? SHADE J.S. 6 36 3 ? ? SIMONS SYLVIA 2 45 1 1873 ? THOMAS WILLIAM 5 19 4 ? ? TONNE JULUIS 5 18 4 ? ? UNKNOWN 2 9 1 ? ? UNKNOWN 6 39 6 ? ? UNKNOWN 6 28 4 ? ? UNKNOWN 7 7 12 ? ? UNKNOWN 7 40 2 ? ? UNKNOWN SO 7 4 3 ? ? VANAGRIFT INFANT 8 36 6 ? ? WILSON LULU 3 55 6 ? ?